What kinds of people settled the new lands of America? They had their own ideas about laws, religion, and what makes a good government. They were, in a word, independent. In 1776, England was far away, and people on this side of the Atlantic were heartily sick and tired of paying taxes on top of taxes to finance England's empty treasury. They were tired, too, of losing money by having the Crown interfere with their trade overseas. The men in the assemblies shouted that King George was a tyrant, so the King's men stopped the assemblies. When they still protested, the King brought in the army, making the colonists put them up in their houses. Any crimes the soldiers committed against the colonists were handled in the King's court by the King's judges. The Declaration of Independence said that King George III, who acted in every way the part of the tyrant, was not fit "to be the ruler of a free people." The signers declared that the new states that they represented had the right to wage war against the Crown, continue to trade as they liked, and set up their own laws. The new government would be by the people and for the people, different from anything modern history had seen. By putting their names on the Declaration, the 54 men might well have been signing their own death warrants. Had the Revolution failed, they would have been high on the list of traitors to the Crown, certain to be imprisoned or more likely executed. Their commitment to a higher ideal despite their differences and the danger of their situation prompted John Hancock to say, "There must be no pulling different ways: we must all hang together." Benjamin Franklin added, "We must indeed all hang together, or most assuredly we will all hang separately." 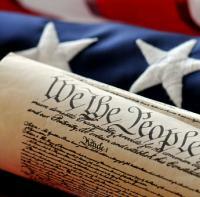 The Declaration of Independence was signed on July 4, 1776. Its brave and fiery words inspired both the citizens and the new American Army to suffer through a long war to defeat the British Army and begin an independent nation. Join Thomas Jefferson as he introduces the story of the creation of the famous document he wrote. For younger students. Also available as an eBook. Learn about the Declaration of Independence, one of the most significant documents in U.S. history. Find out about those who were involved in its creation and why studying this primary source is so important. Includes a timeline that runs throughout the narrative and an explanation of primary vs. secondary sources. Thomas Jefferson may have written the Declaration of Independence, but Sam Fink's drawings bring it to life for students. Every section has its own page featuring light-hearted cartoons that show the meaning of Jefferson's words. Includes definitions of some of the harder words. Freedmen, an award-winning author, begins with the nighttime raid of three ships in Boston Harbor by teenage apprentices and seasoned patriots and follows the course of the American Revolution up to the signing of the Declaration. To soothe the hurt feelings of Thomas Jefferson when Congress makes changes to his draft of the Declaration of Independence, Ben Franklin tells the story of the hatmaker and his sign. What kind of world did children in 1776 know, and what freedoms were their parents fighting to maintain? Separate chapters on slaves and Native Americans make it clear that these groups' liberties were not a part of the plan. Read about the leading role John Hancock had at the Continental Congresses. In 1776 Thomas Jefferson put his quill to paper and the Declaration of Independence sprang to life. Follow the Declaration's journey over the next two centuries, surviving eight wars and traveling through five states on horseback, boat, railcar, and tank to its current home in the National Archives. Also available as a book without CD. 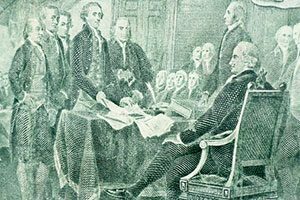 "These three documents, known collectively as the Charters of Freedom, have secured the rights of the American people for more than two and a quarter centuries and are considered instrumental to the founding and philosophy of the United States." Click More under each document's heading for extra information. A transcription of the Declaration and links to more information on the document, with a listing by colony of its signers. Formally written and brief (1 to 2 pages) biographies of the signers of the Declaration of Independence taken from a book published in 1829. The original "Rough Draught" of the Declaration has Jefferson's deletions and additions.